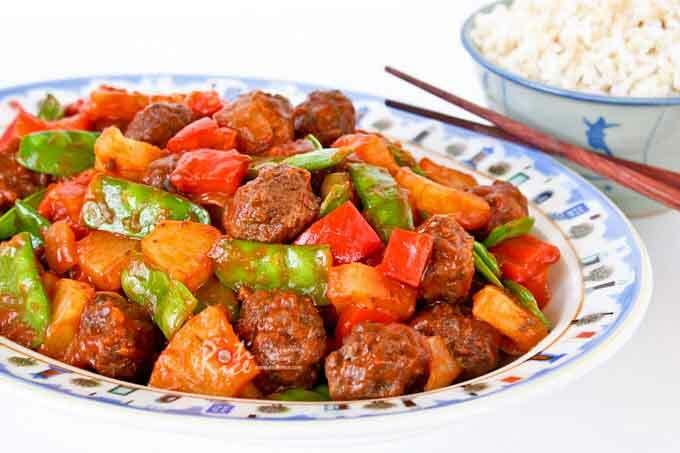 Treat your family to these tender and delicious Sweet and Sour Meatballs combined with bell peppers, snow peas, and pineapples. Homemade is the best! Meatballs are a favorite at our house. They are so versatile and appear often in the lunchboxes and on the dinner table as a side or main dish. Homemade ones are just the best as all kinds of goodies can be mixed in or cooked with them like this Sweet and Sour Meatballs dish. There can never be too many meatballs and leftovers exist only because I plan for them. Most meatballs here are made with ground beef. Occasionally you may find some made with ground pork, chicken, or turkey. These meatballs may contain some bread crumbs, minced onion, milk, eggs, and spices. The texture is soft and tender and they are often cooked in a sauce. Where I grew up, meatballs tend to have a more springy texture. In fact, a good meatball is one that bounces back when bitten into. A soft meatball is considered inferior. The most popular meatballs are made with ground fish but ground shrimp, squid, pork, and chicken are also frequently used. Beef meatballs are less common. Before we continue, I am excited to tell you a little bit about this logo here. 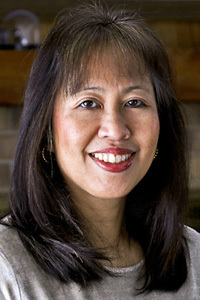 World on a Plate is a blogging cultural exchange and the brainchild of Paola from An Italian Cooking in the Midwest. On the last Sunday of each month, a group of us from different corners of the earth will get together to post a dish using the featured food. Each person represents a country and I am of course representing Malaysia with its 3 major ethnic groups – Malay, Chinese, and Indian. I get to showcase dishes using the featured food from any one of these cultures. In Malaysia, we usually make our own sweet and sour sauce using a combination of ketchup, sweet chili sauce, vinegar, sugar, and salt. For this recipe I used the pineapple juice from the canned pineapples and tomato paste. As the juice is already fairly sweet, I only needed a teaspoon of sugar to round off the taste nicely. Cornstarch is added as a thickener. 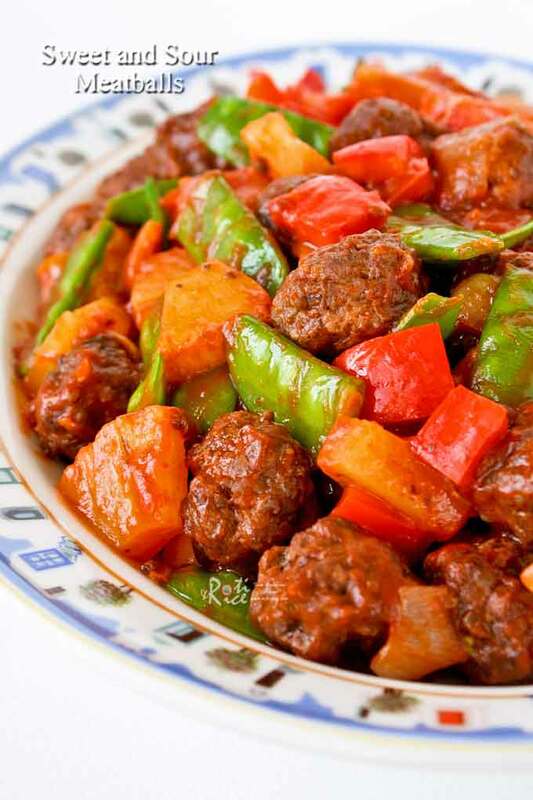 I hope you will give this Sweet and Sour Meatballs a try. In a large bowl, mix together ground beef, salt, pepper, and corn starch. Gather meat in hand and throw against the side of the bowl for about 3 to 4 minutes. Meat will come together in a ball. Shape into 1¼-inch diameter meatballs. Place meatballs onto a non-stick baking pan and bake in 350°F (180°C) oven for 30 minutes. Remove and set aside. Mix all sauce ingredients together in a small bowl. Heat 1 tablespoon vegetable oil in a large wok or pan over medium high heat. Sauté onions until lightly brown. Add red bell peppers and snow peas. Stir-fry for 2 to 3 minutes until vegetables turn to a bright color. Remove and set aside. Heat remaining tablespoon of vegetable oil and sauté garlic for 30 seconds. Pour in sauce mixture. When sauce comes to a boil and thickens, add cooked meatballs. Allow meatballs to cook through. Finally, add cooked vegetables and pineapples. Stir to get everything well coated with sauce, about 1 to 2 minutes. Remove and serve immediately with steamed rice. Please do click on the linky below to find out what the others are doing with their meatballs. Biren I love that we both made sweet and sour meatballs for this and that they are so completely different! It’s so interesting how the concept of what makes a good meatball changes around the world. I can’t wait to try your version! Yes, it is interesting that both dishes have the same name and yet are so different. Your version sounds delicious and I need to make some soon! I love meat balls with sweet and sour combination. Yours looks really addictive. I can’t wait to try your version. While I love my version of these, they are almost bland to what you’re describing. We don’t take making meatballs to THAT level of perfection (springy? ), but ask any German and they will tell you that the love themselves a good “Fleischfrikadelle”. Typically ours are way bigger than what everybody else makes, too. These look WONDERFUL. I know my boys will really enjoy your German version. For them the larger the better. So good to learn about other types of meatballs. I don’t have to make the same ones over and over again. How interesting to hear about something like texture! I never thought it would be that important as I always assumed meatballs should be relatively soft and crumbly… but now I understand meatballs and fishballs for hotpots! These look great! We love meatballs. I may try these tomorrow, as I have some fresh pineapple and peppers around. Thanks for sharing the recipe! Biren – It’s really interesting to learn about “springy meatballs”. I wish you told me this before I tried 3 times to make sure my meatballs came out tender! Just kidding… This really looks delicious with colorful fruits and vegetables. I can’t wait to try. I was wondering about the texture of your meatballs. They look so delicious and perfectly formed. Thanks Patty! We enjoyed them very much. I just needed to cook some rice to go with this dish as it has both protein and veges in it. Love sweet & sour pork but I’ve yet to try meatballs. Interesting concept here. I can taste the sourness in my mouth already. Hahaha! Hey Biren, u may like to get some haircare tips from my latest Get Shiny Hair With NEW Vidal Sassoon Premium Colour Care Ritual! See u there! usually i cook this dish with pork..your look so tempting, i need more rice for this dish,yummy! I love seeing how meatballs are cooked by different cultures! This is a really unique version that I’ve never seen before. Thanks for sharing! Love the combo of sweet and sour flavours. The dish looks very appetizing. Yum, Biren! I love everything sweet & sour, but I have never tried it with meatballs! This sounds (and looks) really yummy! Thanks for sharing this with me 🙂 I think I’ll make it for dinner soon! Great idea for a blogging group, sounds like lots of fun! These meatballs look SO good – great flavors, love them! Definitely need to give these a try sometime soon. Baked meatballs, a healthy version instead of fried! Looks delicious! My kids love sweet sour anything! Thanks for sharing, have a lovely day! You are most welcomed! 🙂 I am glad to hear that you finally succeeded in making castella. The version I described is relatively fuss-free. Your meatballs look so delicious Biren! I like that you baked them instead of pan fried – less work! =D My kids love meatballs and this recipe is a keeper for sure! 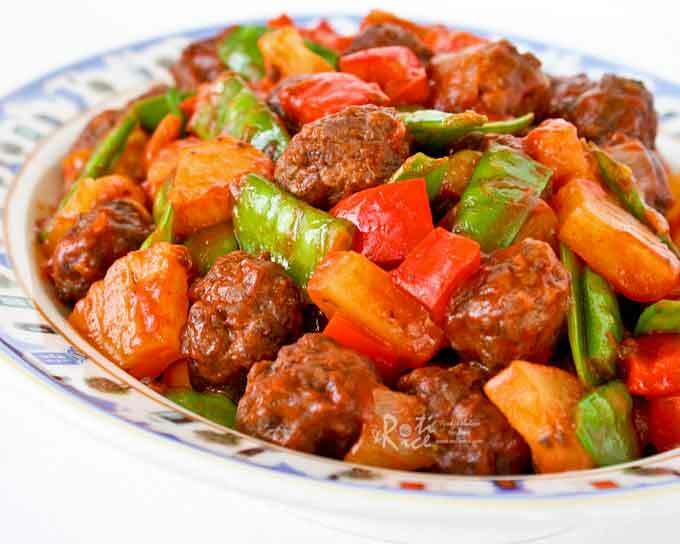 Your sweet and sour meatballs look so beautiful, Biren! This is one of my family’s favorites! Such a good idea to bake the meatballs instead of frying them. I love these type of meatballs- great recipe and they look wonderful! Biren, so interesting on the meatballs, and this World on a Plate is so cool! I want to check it out more. I can’t believe all you do! Funny I made meatballs this week, but I never use ground beef, usually pork or chicken. I know my family will love your sauce! Biren, it is so interesting on the meatballs, and the World on a Plate.. I’ll have to check it out. I can’t believ all you do. Funny I made meatball this past week too, I like to bake them as well, but usually use pork ot chicken. I know my family would love yours and that fantastic sauce! Hi Biren 🙂 Love your meatball dish, it looks like a rainbow on a plate! My boys love meatballs, both springy (as a mattress) and tender fall-apart-in-the-mouth ones. Swedish meatballs are an especial favourite in our home and leftover meatballs in any guise are a coveted commodity lol. When I was very much younger, I used to help my mother scrape fish of the bone and watch her pound and pound the fish meat to make bouncy fishballs. Definitely no fun there, but eating them in steamboat was fantastic *sigh* Btw, your home page looks so polished and professional. Very impressive! I can have them on their own ….yum, yum! WOW – definitely one to bookmark for the family! And I already told you how I like that picture – so colourful and appetizing!